Lucy's Tavern is the best kind of small-town bar. It has a good jukebox, a bartender with a generous pour, and it's always open, even in terrible weather. In the raw and beautiful country that makes up Rebecca Barry's fictional landscape, Lucy's is where everyone ends up, whether they mean to or not. There's the tipsy advice columnist who has a hard time following her own advice, the ex-con who falls for the same woman over and over again, and the soup-maker who tries to drink and cook his way out of romantic despair. Theirs are the kinds of stories about love and life that unfold late in the evening, when people finally share their secret hopes and frailties, because they know you will forgive them, or maybe make out with them for a little while. In this rich and engaging debut, each central character suffers a sobering moment of clarity in which the beauty and sadness of life is revealed. But the character does not cry or mend his ways. Instead he tips back his hat, lights another unfiltered cigarette, and heads across the floor to ask someone to dance. A poignant exploration of the sometimes tender, sometimes deeply funny ways people try to connect, Later, at the Bar is as warm and inviting as a good shot of whiskey on a cold winter night. Lucy's Tavern is the best kind of small-town bar. It has a good jukebox and a bartender with a generous pour, and it's always open, even in terrible weather. In the raw and beautiful country that makes up Rebecca Barry's fictional landscape, Lucy's is where everyone ends up, whether they mean to or not. 1. In the opening story, how does the description of the way the regulars imagine the presence of Lucy's spirit in the wind (page 7) establish the significance of Lucy's Tavern? 2. In "Men Shoot Things to Kill Them," Harlin believes that Grace, his new wife, may be cheating on him with Jimmy Slocum, as she has left town with him to go to a bowling tournament. Harlin explains, "The trouble with his new wife...was that she had terrible taste in men" (page 16). Do you think that Harlin is aware of the irony in this statement? Given the details later revealed about Harlin's own transgressions, is he just like Grace's exes who treated her like dirt, or is he different? 3. In "Snow Fever," after missing the chance to have any kind of romantic encounter with Madeline, why does Bill break into Hank's Diner and make soup in the middle of the night? Why does he ignore her when they pass each other on the street during the day? 4. The story titled "Grace" focuses mainly on Grace and Harlin's brief reunion. Besides referring to the character herself, does this story's title have a double meaning? Why do you think this may be the last time that Harlin and Grace "would be together like this" (page 120)? 5. In "Not Much Is New Here," why has Linda made it her profession to give other people advice? 6. In what ways does Linda and Austin's reunion in "Not Much Is New Here" mirror Grace and Harlin's night in the previous story? Are Grace and Linda the same? Are Harlin and Austin? In each situation, how does one final night together clarify the impossibility of their relationships? 7. In two separate instances, we see female characters attempt to save a bird that's been wounded in one way or another. When Janet, Cyrus, and Harlin come upon an injured pair of geese in the middle of the road, Janet shoots the goose suffering from fatal injuries and does everything she can to save its surviving mate (page 34). In the story titled "How to Save a Wounded Bird," Elizabeth Teeter makes two different attempts to save baby birds that her cat has attacked. In each example, what is the symbolism of the birds and the effort made on their behalf? Besides general compassion, why do you think each character does what she does? 8. What do Elizabeth Teeter's trip to the Wildlife Center and Trevor's tragic story teach her? 9. "Instructions for a Substitute Bus Driver" is the only story in the novel that is written in first person. Why do you think the author selected Madeline to be the only character to narrate her own story? What effect did this perspective have on you as a reader? 10. How did you feel when it was revealed in the final story that Harlin passed away? 11. "It was the thing that had always gotten her about Harlin, his relentless hope. It was what kept him from being a bad man, and part of what made him a stupid one" (page 223). Do Grace's feelings about Harlin describe any other characters in Later, at the Bar? What messages about love and life, seen through Grace's perspective, are found in this novel's conclusion? 12. "So, cursed or not, Lucy's Tavern was the place most people in town came to lick their wounds or someone else's, or to give in to the night and see what would happen" (page 6). Lucy's Tavern is at this novel's center. As this passage suggests, it has different purposes for different people. Discuss what Lucy's Tavern means to the various characters that frequent it, such as Harlin, Grace, Linda, Cyrus, Bill, Hank, and Rita. 13. In a novel with a bar as its main setting, alcohol obviously plays a major role. In what ways is drinking shown to be detrimental? How is it portrayed as something that is beneficial? 14. Though the larger narrative connects the characters and events throughout Later, at the Bar, each story can stand alone. Did you have a favorite? Discuss with the group. 1. Explore your creative writing skills. Write a short story focusing on characters of your choice from Later, at the Bar. Determine where you would insert the story into the novel, and share your story with the group! 2. 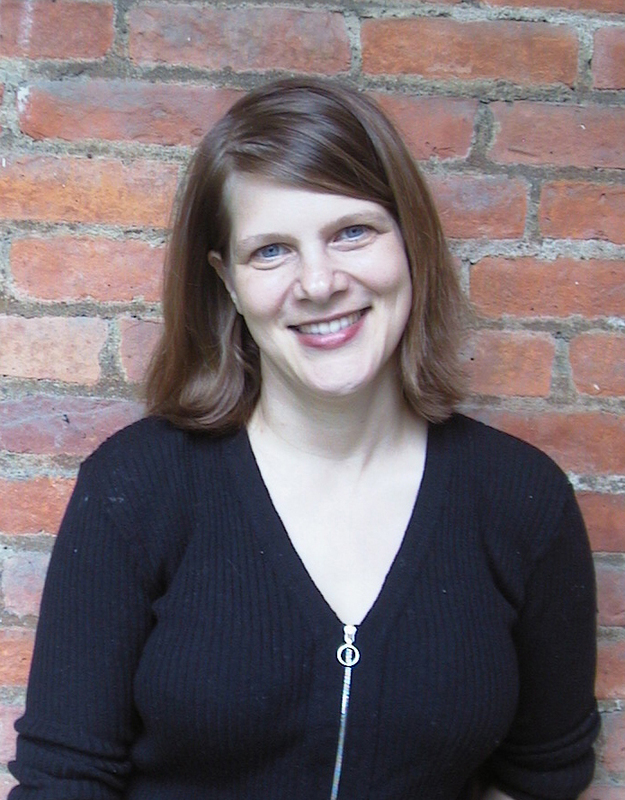 Rebecca Barry's writing has been widely published in magazines, newspapers, and journals. Find some of her previous work on the internet, and compare her earlier material to Later, at the Bar. 3. What is the Lucy's Tavern in your town? Whether it be a bar, coffee shop, or diner, hold your book club meeting at the local gathering place. "Rebecca Barry's debut is a sheer delight. These stories are delicate, smart, touching, and hilarious, and they move through the life of a small town the way life moves through us. Barry is a wonderful writer, graceful, quick, and compassionate." 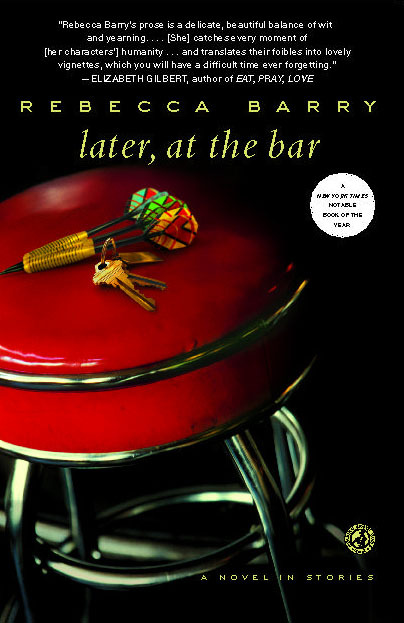 "[A] marvelous debut work of fiction...Later, At the Bar is funny, fast, and addictive. It is an intoxicating book, beginning to end. Barry's characters are so smart, hilarious, and real that one can't help being utterly seduced by them and what their lives teach us about 'the rough and beautiful ways people carried their loneliness. '...Read this book."